A morning in Paris - or is it San Francisco? One of my most enjoyable experiences in San Francisco was the day I went exploring the "French Quarter" in San Francisco with a professional tour director, and a great friend of mine. I am in San Francisco quite a lot, yet I never knew about this area in the heart of downtown. This is very much an "off the beaten path" experience which kicked off my series of articles I have written for local publications. It has been so much fun for me to go back and retrace these steps that my friend taught me - and experiencing this area of San Francisco that is not on the standard tour. I do reminisce the memories we shared together on our first walk - tasting the French flair throughout our city by the bay. This week I share with you this experience that began my journey of looking around the corner during my trips. 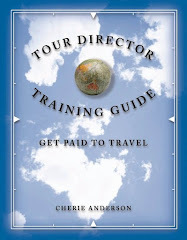 I have made such great connections with Professional Tour Directors located across our nation - each with their own inspiring stories as they continue to lead groups across the world, much in the same this Professional Tour Director led me through the San Francisco streets. J’ ai mal ici …Ou sont les toilettes? …Oops, forgive me, I am practicing some French! Bonjour….Voulez vous visiter la France? Are you familiar with the traditions, culture, and language of France? Are you planning a trip to France and want to learn and practice the language first? Or would you just like to explore Paris close to home? Maybe you just came back from France and want to continue your French experience? J’aime la France…Il est beau (umm… he’s handsome?) Or maybe you are looking for a handsome Frenchmen to escape with you in your dream? Tucked away in the heart of San Francisco is the special area of Little Paris and the French Quarter. Here, you will feel as if you have truly spent a morning in Paris as you discover an area that is rich in history and boasts an exotic present. These paths are difficult to discover on your own. It takes a professional tour guide to create a comfortable surrounding where you may practice French, with new friends, and listen to tales of this unique area. Mathieu has designed this well thought out tour for you to have fun and a memorable experience in these city streets. Is this tour a history lesson, sightseeing, an exploration of the wonderful French restaurants or a lesson in the French language? It is all of the above in just four to five hours. You will discover the Alliance Francaise and French Library – the largest west of the Mississippi. There is a visit to Notre Dames des Victoires – a French church designed after an actual one in France and its stained glass tales. A stop at Café de la Presse is a charming opportunity where you can read daily international newspapers and magazines while lingering over French espresso and a croissant. You will see and hear the tales of the Grace Cathedral which was designed after prominent churches in France. Which ones? You will find out on the tour. Also, you will rediscover familiar San Francisco landmarks as you are guided through the city streets. Then it is off to a selection of the most authentic French Restaurants where you will believe you are really in France. Without Mathieu, you might miss the quaint Café Claude, where you will be reminded of Paris. Seating is inside or out and everyone is friendly as they converse in French. Brunch may start either in the outdoor seating area on the sidewalk or inside with the most “délicieuse” French Onion soup and a glass of French merlot. Truly “bon”! Order the Confit de Canard (duck confit with French lentils, onions, celery, carrots, bacon and sauce moutarde), which is “magnifique”! Luckily for you, when you are done you will find out about several other fine French restaurants like this one, just ask your tour guide. Bon appétit! Mathieu, our French Tour Guide, grew up in the heart of Paris where he walked to work everyday to his father’s place of business. He has lived the stories he shares with us. He relocated to the United States where he has followed his own dream and works as a professional tour director. He has been nominated by the Silicon Valley Concierge Association (SVCA) for Best Tour Guide, is a certified San Francisco Tour Director through San Francisco Tour Guide Guild, and is an ITMI certified Tour Director. Mathieu is a patient instructor and says, "he believes that it is easier and fun to learn another language by using and sharing with friends in actual everyday life.” And this is what you will do, as you wander the streets of the French Quarter in San Francisco. You may even ask for the tour to be given entirely in French! You learn key facts from Mathieu such as the differences between the eating establishments in France, bistro’s and brasserie’s, which to have a drink in and which are the finest dining. Do you know why women always go ahead of men in most scenarios except when entering restaurants in France? Is this a tradition? This is an interesting and fun way to learn about France. The special stories told by Mathieu make this adventure come alive. Are you concerned with walking the San Francisco hills? This tour has been well thought through and uses a quick hop on one of the historical San Francisco cable cars to go up hills. Truly wonderful and easy to follow. Exciting and fun also! Merci! If you are interested in learning and exploring the French culture and history and want to practice the language with someone who will give you personalized assistance – or just want a new adventure in this area, this walking tour is recommended – 5 stars! It is educational and also fun! The location is a surprise as you discover with this professional tour guide. Au revoir … a morning in Paris so close to home. Note: Information about this walking tour and professional tour director; or other Professional Tour Directors across USA may be obtained by e-mail. Advanced reservations are best, as these professionals are active with groups. 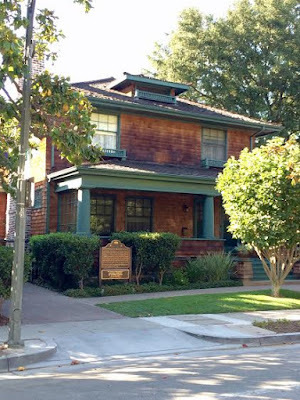 Why is Palo Alto called the “birthplace of Silicon Valley”? Let's return back to the 1700s. Yes, there are many opinions, and with a quick “google” this is the Spanish definition of Palo Alto which means “ stick” and “high". Where is this "high stick"? One of our oldest residents is an easy walking distance north of downtown Palo Alto and east of the railroad tracks (and not very far east), El Camino (the King’s Highway), and Stanford Shopping Center. The famous, El Palo Alto Redwood, located in El Palo Alto Park, corner of Alma and Palo Alto Way, on the banks of San Francisquito Creek. The tree is California Historical Landmark #2. It is recognized as the campsite of the Portola expedition in 1769 and used as a sighting tree when plotting out the El Camino. There is a picture at California Historical Landmark. This Sequoia sempervirens, Coastal Redwood is 90 inches in diameter, 110 feet in height (compared to 134.6 feet in 1951) and has a crown spread of 40 feet. Yes, this tree as of 2002 is 1,061 years old and considered healthier today than 100 years ago! The stories this tree may tell. I actually went on this magical, fairy tale walk and it is an easy walking trail to visit our oldest citizen. Our oldest resident, imagine the stories it may be able to tell through these years? It is so close to the newest valley innovations and a definite item to add to your list to discover – right in our own backyard! Remember, El Palo Alto, is over-seeing our activities while we dine, shop and live in the downtown Palo Alto. At this height, it might even see us all the way to the capital of Silicon Valley, San Jose. Share your El Palo Alto story with us now in the comments! Find more information of this tree at Palo Alto History Organization website. El Palo Alto is older than this house!